Shaved brussels sprouts thinly sliced pear with a mix of parsley. 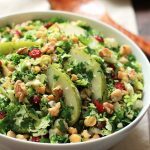 This simple Pear-Brussels Sprout Salad is fresh, crisp and full of flavor, perfect for warm Spring days. It’s amazing how our taste change as we age, I attribute that to the maturing of our taste buds. When I was a child I strongly disliked Brussels Sprouts and unfortunately for me my childhood home was one in which dinner was a non-negotiable. Breakfast was decided by whoever made to the kitchen first, lunch was free choice, dinner was decided by my Mom, who made it clear she wasn’t a short order cook and as long as she was responsible for our health and well-being, we would have to eat the foods she prepared. Whenever we had Brussels Sprouts, I called them baby cabbage, I would eat everything else on my plate and leave them with the hope that my mother would tell me I didn’t have eat them. No such luck. Years went by before I gave Brussels Sprouts a try again. I’m not really sure when I decided to try them again, but when I did my opinion had changed. Brussels Sprouts was once again a part of my diet, my choice. I found myself including it in my salads which has become one of my favorite ways to have it. 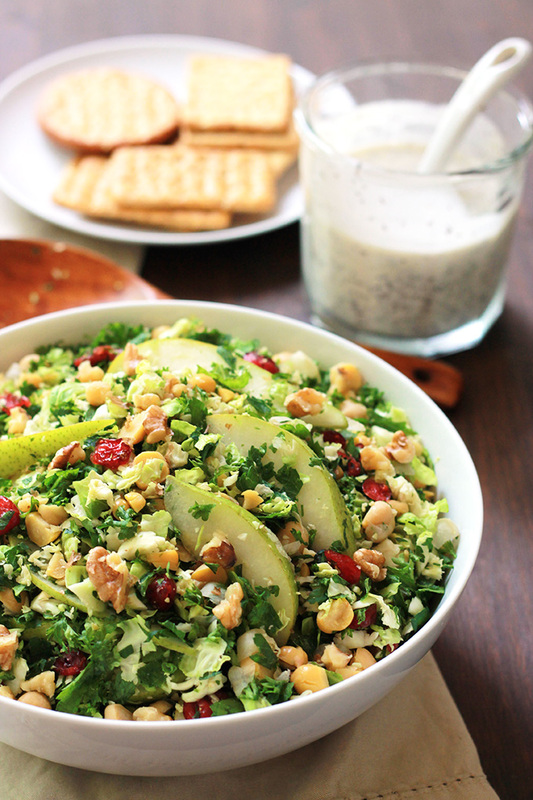 This Pear Brussels Sprouts Salad, which is so easy, has become one of my all time favorites. It’s fresh, crisp and so delicious when served with the Poppy Seed Dressing I shared here last week. Wash and trim the sprouts, place in the food processor and shred. Remove and place in a large bowl. Wash, dry and roughly chop parsley, add to bowl with the Brussels Sprouts. 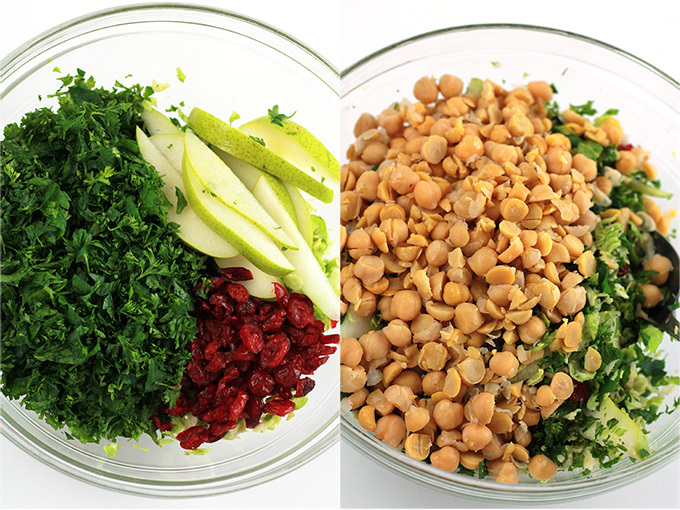 After rinsing and draining the chickpeas, roughly chop and add to bowl. Add pears, cranberries and walnuts and toss everything together. Make the Poppy Seed Dressing. Serve salad allowing those being served to dress their own salad. Store any remaining salad in an airtight container in the fridge. If you make this recipe or a version of it, take a picture and share with me on Instagram, tag it #thewholeserving or leave a comment below. 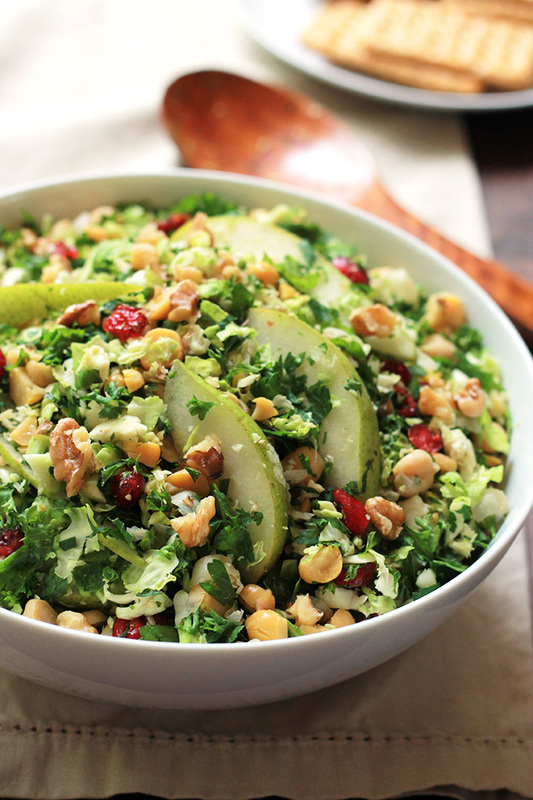 I’d love to see or hear about your version of this Pear-Brussels Sprout Salad. This looks so good. I’m going to try it for dinner today! Thank for visiting Mary, I hope you are doing well. Have a wonderful Memorial Day weekend. This sounds like a delicious combination. I never liked Brussels Sprouts until the last few years. Now I love them roasted or in salads! Cathy this is so delicious, I ate it for lunch three days. I love how all the flavors combine. 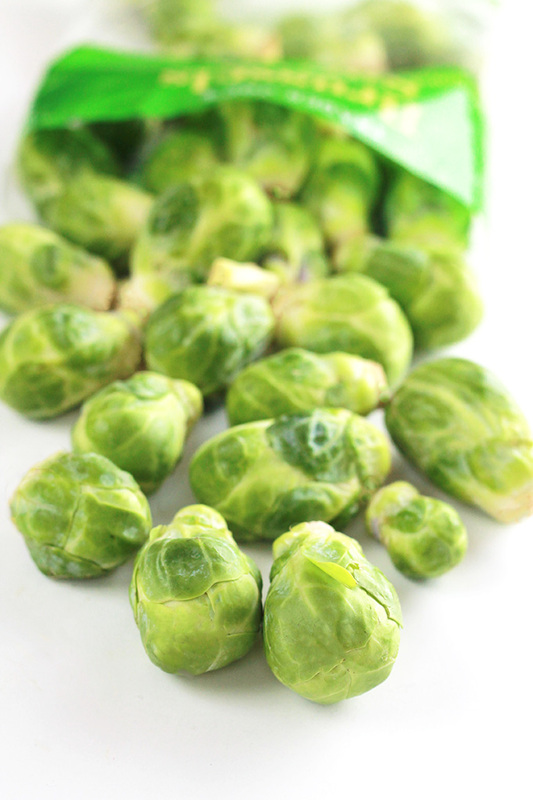 I love Brussels sprouts (as an adult… was like you as a kid!) in all forms, but especially in salad form. So fun and so yummy! Love the spring flavors here with the pear – what a great combo! Pinned and can’t wait to try it! Thanks Kathryn, Enjoy and have a safe and Happy Memorial Day! This salad looks healthy, but also oh-so-tasty! I’m like you–I really like brussels sprouts now, but couldn’t stand them as a kid. Amazing how our tastes change! Lovin’ this healthy and pretty salad! Thanks for linking up with What’s Cookin’ Wednesday! Thanks for hosting Carly, I try to link each week but I always get to the party too late. Sounds like we grew up in the same household. 🙂 I love brussels sprouts, they’re so healthy and nutritious. I love how you “paired” with the pear. Genius! Thanks for sharing this one with us! It is so true how our tastes change as we get older. I was never really a fan of any veggies but have discovered so many new ways to have them, like in your salad, that they are now so much more appealing. Love the sweet pear, tart cranberry combinations with the more savory and crunchy sprouts and walnuts. Looks really delish. Thanks Melissa, It’s amazing how the flavor combinations in this salad come together with so much deliciousness. 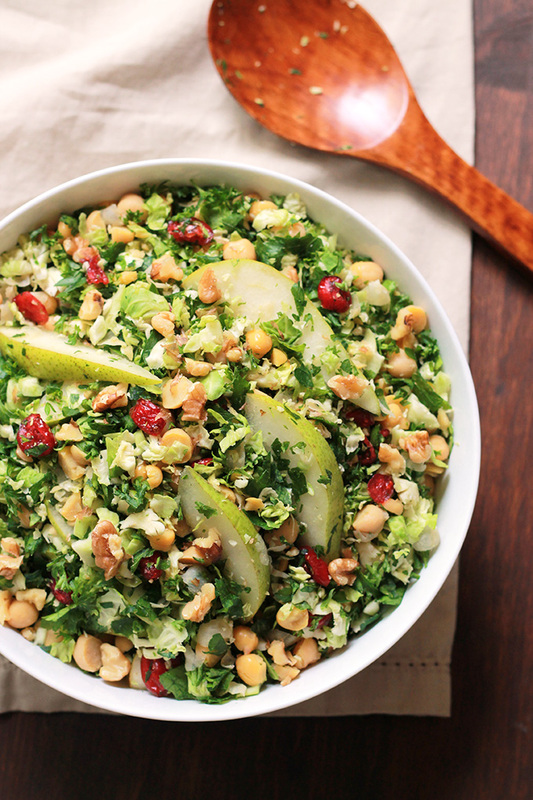 We love brussel sprouts and this salad looks like perfection, all good things in one bowl! Not only does it look healthy, it’s visually appealing too, that’s more than half the battle. I find that when healthy food looks really good we eat more of it and want to have it again and again. This is one of those items! Delish! You are so right Nikki, we eat with our eyes first. And in my house if it looks good it’s more likely to get eaten and when food is eaten it can do it’s job of norishing us. I love brussels sprouts and this looks delicious! Thank you Anne, I hope you are having a great week, I’m ready for the weekend! You never cease to amaze me. What a creative way to approach salad making. I never thought of using brussels sprouts this way. 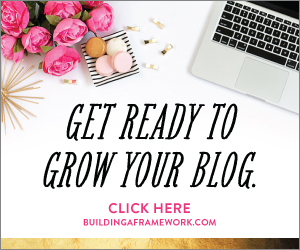 I’m featuring this post this week. It’s awesome! I’m pinning and sharing. Thanks Deborah, I really appreciate the feature and I hope you give this salad a try soon. I’m definitely making this for my healthy work lunch club! That sounds like a nice club to be a part of. I hope all of your club members enjoy the salad. Please if you can let me know how it goes. I love this, Celeste. I need to start making brussels sprouts. Especially raw like this. 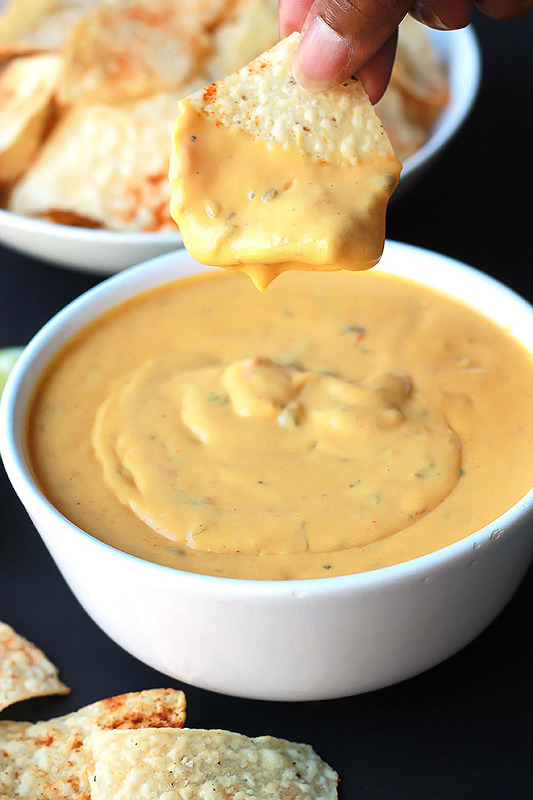 Love the flavors in this, and can’t wait to try that dressing, too. Thank you Christine, I think the dressing is what makes a big difference in the salad. I have been making this dressing and using it on just about all my salads lately. and thanks again for the feature. This dish looks so delish! I love brussels sprouts. I yummed your recipe. Thanks so much for sharing with us at Merry Monday. I’m glad you like it Sherry and thanks for sharing. So fresh, healthy and delicious! My family will eat this up! I am so delighted that you shared your delectable Pear-Brussels Sprout Salad with us at the Healthy Happy Green Natural Party! I’m Pinning and sharing this! I cant get enough brussels to eat , I love them. I buy them often and eat a whole bag of them just steamed and this will be a great change! We happen to love brussels sprouts any way. This is a great way to enjoy them. Perfect side dish to any meal. Great to take for lunch too. I actually do love Brussel sprouts and usually make it cooked but salad sounds so flavorful and yum. Healthy and nutritious too. Love how beautiful the cranberry looks on top. Saving this for later. This looks delicious! What an innovative way to use pears and brussels! I would never have thought of putting them in the same salad. Looking forward to giving this a try. The flavors are amazing together, a nice balance between savory and sweet. I agree with you, my taste has definitely matured!! I never ate Brussels sprouts and now we have them weekly. One thing we haven’t had though is the sprouts in a salad. I love the addition of the pears. 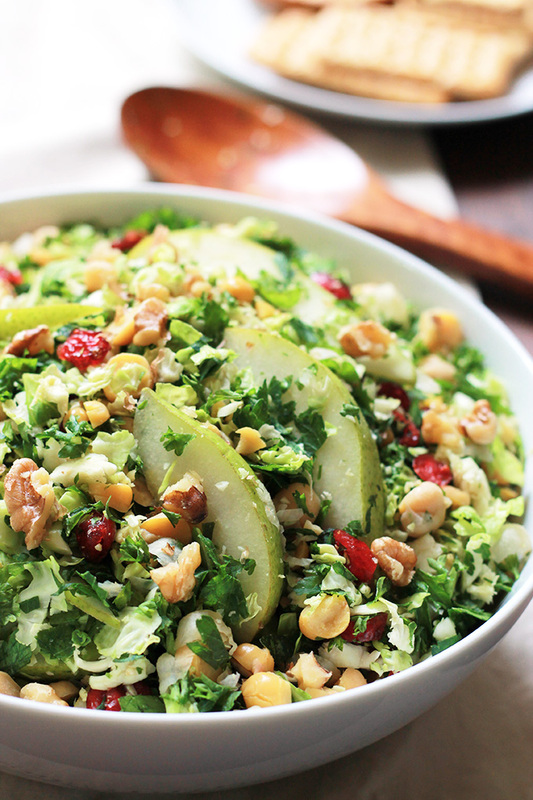 Fall salads taste so good with apples or pears. Will be making this salad soon. I also didn’t like brussels sprouts growing up and now I love them! My favorite ways to eat them are roasted or in yummy salads like this! I absolutely LOVE brussels sprouts!! I have never tried it in a salad though, so this is the next thing on my to-do list! That salad has really nice color. I have a friend that loves brussel sprouts, I am certain she’d enjoy trying this brussel spouts salad. This is wholesome salad with Brussels sprouts, I haven’t tried raw Brussels sprout, usually cook them . I need to try it as it has chickpeas in it, it filling and protein rich with sweetness from pears. This salad looks so fresh and flavorful! I love all of the colors and fresh take on salad greens. I think my family would love this salad as part of our dinner meal.